Durable bristles can scrub away stains and dirt easily.Safe for use on non-stick surfaces,such as scrubbing pots, pans dishes and more. Features: It is made of high-temperature resistant nylon brush, which is soft and does not damage the surface coating of the pot. Press-type design, easy to use, pots, plates, stoves, etc. can be cleaned. Small size and easy to operate. The intensive brush is not deformed for a long time, and the humanized anti-slip handle is more labor-saving. 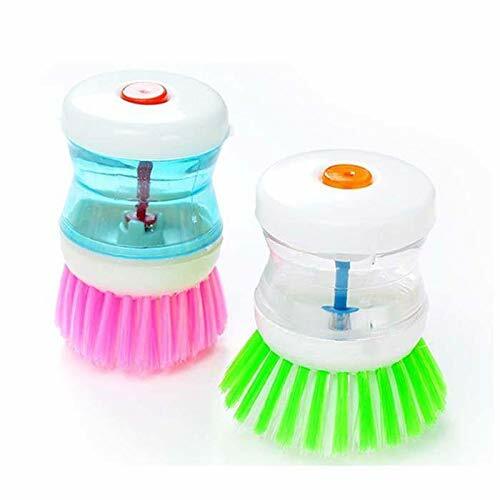 Brush Length: 2.5cm/1.0inch,non-slip handle for a secure grip, even when wet.The Tough bristles easily scrub away mildew, grime and soap scum.